Fig. 1. Schematics of mesh electronics. (A) Schematics of the mesh electronics structure in 2D. (I) Overall design of mesh electronics structure, where the blue lines highlight the overall mesh structure, the black filled circles at left indicate I/O pads, and the red filled circles indicate recording electrodes. (II) A single unit cell of mesh electronics, where the orange lines, which are shown without top polymer layer, highlight the metal interconnects and blue lines correspond to polymer passivation layer; w1, w2, and wm indicate the widths of the longitudinal polymer, transverse polymer, and metal lines, respectively. The schematic in the green dashed box highlights the cross-section view, which shows the polymer encapsulated metal structure, at the position indicated by the green dashed line. (B) Schematic of free-standing mesh electronics floating in aqueous solution and ready to be loaded into a glass needle. (C) Schematic of mesh electronics injected into mouse brain, with part of the mesh sagging between the brain and the needle. (D) Schematic of mesh electronics implanted in brain tissue with horizontal (yellow plane) and sagittal (green plane) sectioning directions highlighted in the inset. (E) Schematics of the interface between mesh electronics and the brain tissue (Left, cross-section view) and that between flexible thin-film and the brain tissue (Right, cross-section view). Mesh elements and the flexible thin-film are highlighted in blue, neurons are in purple, and glial scar is in yellow. Credit: Zhou T, Hong G, Fu T-M, Yang X, Schuhmann TG, Robert D. Viveros, RD, Lieber CM (2017) Syringe-injectable mesh electronics integrate seamlessly with minimal chronic immune response in the brain. Proc Natl Acad Sci USA 114(23):5894-5899. (Phys.org)—Neuroprostheses, neural probes and other intraneural tissue implants have offered remarkable benefits to recipients in a number of areas in neuroscience research and biomedical applications, therapeutic examples being not only Alzheimer's Disease, Parkinson's Disease, epilepsy, traumatic brain injury, and other neurological/neurologically-related conditions, as well as cognition, memory, and sensorimotor disorders. However, current neural implants have several drawbacks, including neural tissue inflammation or scarring due to device micromotion, as well as longevity and the potential need for removal, and high power requirements. Devising electrical probes that seamlessly integrate within neural tissue has therefore been a coveted goal. To that end, scientists at Harvard University have reported the successful implantation of a neuromorphic (that is, having a structure similar to brain tissue) ultraflexible open mesh electronics neural probe that is delivered to specific brain regions via syringe injection (a protocol they published in 2015 in Nature Nanotechnology)1. The probe—which does not require a power supply—directly records neural voltage changes by being able to interface with all regions of the brain from the level of single neuron through circuits and networks, in which the mesh recording electrode is connected by passivated metal lines (that is, having a protective coating applied to its surface) to input/output pads located at the opposite end of the mesh structure. These I/O pads, in turn, are then connected to Flat Flexible Cables (FFC) and plugged in external system for recording. The researchers also conducted systematic post-implantation studies, finding minimal or absent neural immune responses, and moreover that brain tissue had penetrated and merged with the mesh probe. The scientists note that the mesh implant may never require removal—but if it does, doing so would be a straightforward if not issue-free procedure. 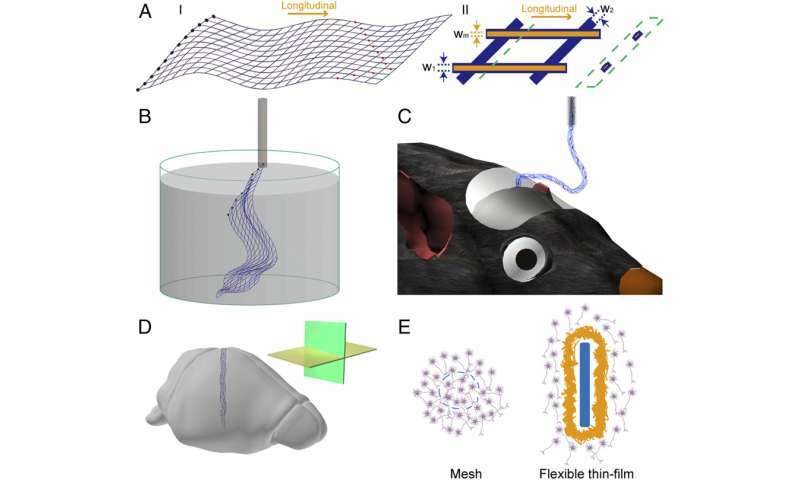 They conclude that most areas of fundamental neuroscience research could benefit from mesh electronics providing long-term stability and single-neuron resolution—unique capabilities not found in conventional neuroprosthetics—and state in their paper that ultraflexible open mesh electronics probes could in the future enable a wide range of opportunities for in vivo chronic recording and modulation of brain activity. Chemical Biology Mark Hyman Jr. Professor of Chemistry Charles Lieber discussed the paper that he, Lead author Graduate Student Tao Zhou, Postdoctoral Fellow Guosong Hong, and their colleagues published in Proceedings of the National Academy of Sciences. "The main challenge of designing and implanting an injectable ultraflexible open mesh probe is ensuring the design has four key features," Lieber tells Phys.org. These factors are mesh openings larger than cell bodies to facilitate neuron penetration; mesh element features that are the same size or smaller than neurons; flexibility that in this study was many orders of magnitude greater than that of neurons; and mesh electronics that can be easily injected through very high-gauge needles to precisely control the mesh position. "By designing the mesh electronics such that all key properties are neuromorphically similar to neural tissue, we eliminate chronic immune response that is found with all other probes and medical implants, which are more like thorns in your tissue." As mentioned earlier, the scientists' 2015 paper initiated the concept of syringe injectable electronics, which Lieber notes opens up a new field with many opportunities awaiting further studies—an example being co-injection of electronics and cells where mesh electronics also functions as a tissue growth scaffold relevant to regenerative medicine. "In the paper being discussed herein we report systematic time-dependent chronic histology studies of the tissue-mesh interface after the mesh probes were implanted into rodent brains. Both horizontal (which contains cross-sections of implanted mesh probes) and sagittal (which contains nearly the entire implanted mesh probes) brain slices were used for immunohistochemistry and were stained with antibodies that can target neuron somata, axons, astrocytes and microglia. The results in this paper reveal the uniqueness of mesh probes in terms of minimal or absence of tissue response and neuron penetration when chronically implanted in the brain. Fig. 2. Time-dependent histology of horizontal tissue slices containing implanted mesh electronics and flexible thin-film probes. 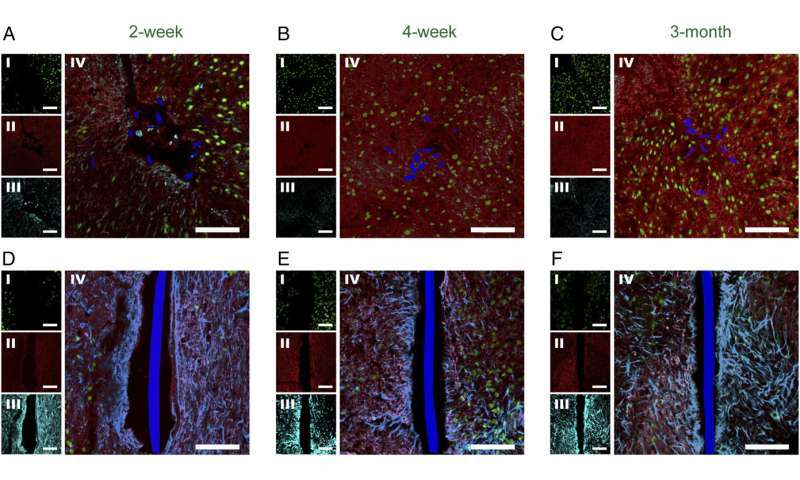 Confocal fluorescence microscopy images of horizontal tissue slices containing mesh electronics/flexible thin-film probes at 2 wk (A and D), 4 wk (B and E), and 3 mo (C and F) postimplantation. In all of the panels the image labels were NeuN (I, green), NF (II, red), GFAP (III, cyan), and NeuN, NF, GFAP composite (IV). The mesh electronics and flexible thin-film cross-sections are pseudocolored blue. (Scale bars in all images, 100 μm.) Credit: Zhou T, Hong G, Fu T-M, Yang X, Schuhmann TG, Robert D. Viveros, RD, Lieber CM (2017) Syringe-injectable mesh electronics integrate seamlessly with minimal chronic immune response in the brain. Proc Natl Acad Sci USA 114(23):5894-5899. Lieber points out that the neuromorphic nature of the mesh electronics probes is related to the above three points, the bio/neural compatibility of the polyimide polymer used for the mesh, and the post-implantation open three-dimensional mesh structure. Together, he adds, these features make the injected mesh electronics quite similar to neural networks that comprise brain tissue, and therefore quite distinct from conventional probes. Fig. 4. Histology of a sagittal tissue slice containing nearly the full implanted mesh electronics probe. (A and B) Confocal fluorescence microscopy images of a sagittal tissue slice including the mesh electronics probe at 3 mo postimplantation. Each of the images are 3×3 composite images recorded directly in the Tile Scan mode, where each component image of the Tile Scan had a field of view of 425 μm × 425 μm. 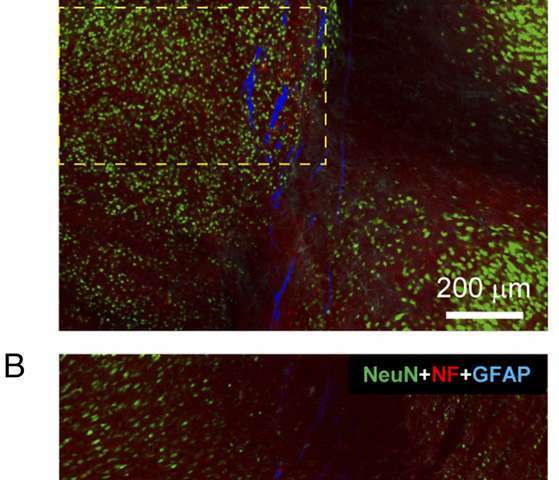 The tissue slice was stained with antibodies for NeuN (green), NF (red), and GFAP (cyan); the mesh is shown as pseudocolored blue. The images were recorded at an optical focal plane ca. 5 μm below the surfaces of side-A (A) and side-B (B). (C) Fluorescence intensity as a function of distance from the boundary of the mesh electronics in images of side-A (A) and side-B (B). The pink shaded regions indicate interior of mesh electronics on each side. The NF and GFAP fluorescence intensity was analyzed based on the entire images, and the NeuN fluorescence intensity was analyzed based on the regions shown in yellow dashed boxes in A and B. Error bars represent SEM. Credit: Zhou T, Hong G, Fu T-M, Yang X, Schuhmann TG, Robert D. Viveros, RD, Lieber CM (2017) Syringe-injectable mesh electronics integrate seamlessly with minimal chronic immune response in the brain. Proc Natl Acad Sci USA 114(23):5894-5899. "The main challenges of demonstrating that the probes do not elicit inflammation or scarring—unlike the typical chronic tissue response—is to characterize the tissue-mesh interface at different times post-implantation," Lieber explains. To accomplish this, without removing implanted mesh probes the researchers sectioned mouse brains into both cross-sectional and longitudinal or sagittal (left/right) slices. "Investigations of both cross and longitudinal sections with the implanted mesh electronics probe provided detailed and global views, respectively, of probe/tissue interaction," he notes, stressing that in most cases conventional probes must be removed from tissue before sectioning, resulting in loss of some critical interface information. "The horizontal and sagittal brain slices—which contain cross-sections of implanted mesh probes, and nearly the entire implanted mesh probe, respectively—were stained with antibodies that can target neuron somata, axons, astrocytes and microglia," Lieber continues, Moreover, he points out that these studies demonstrated that unlike conventional probes, neuron somata and axons around mesh probes were not harmed, and led to natural tissue levels at the mesh probe surface. "Similarly, the markers for immune response inflammation highlighting astrocytes and microglia showed that these species became background level after only a couple of weeks in the mesh electronics—but they proliferated and accumulated at the interfaces of conventional probes." The scientists also found that the ability of allowing the neurons and mesh to interpenetrate is universal for all meshes they injected and imaged at 6~12 weeks post injection, prompting them to initiate additional experiments to find out how the size of mesh electronics structural elements and other parameters might be tuned to enhance the capability of neuron interpenetration. It should be noted, Lieber tells Phys.org, that the researchers are being conservative when in their paper they write a minimal immune response pending more detailed marker analyses. "In fact, we believe there is no immune response from the mesh because our results show that any initial enhancement in astrocyte and microglia return to background with no measureable difference proximate or distal to the probe at 12 weeks—and, as shown in our 2016 Nature Methods paper1—up to at least one year. We thus believe that the response is due to acute damage that occurs when inserting the needle (or for that matter, any probe) into the brain—but given the lack of immune response from the mesh probe, this acute damage all heals over time, as opposed to worsening, as is the case with conventional probes." Fig. S2. Time-dependent histology of chronically implanted mesh electronics (A–C) and flexible thin-film probes (D–F) in mice brains (horizontal sections). 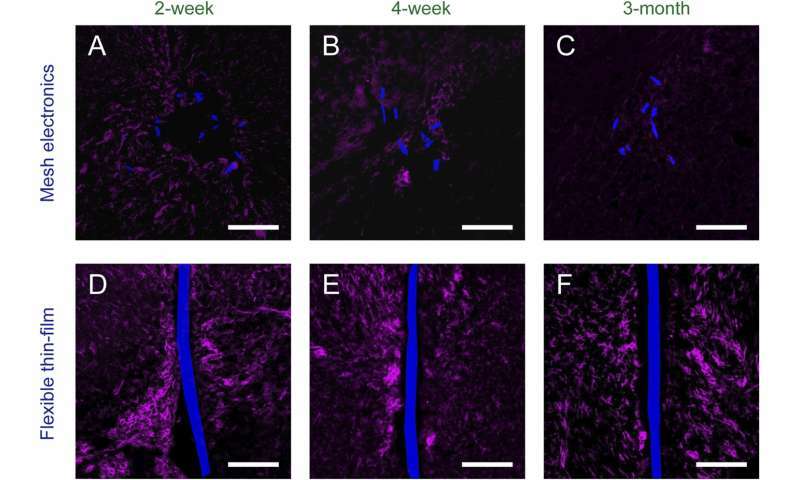 Tissue slices are labeled with Iba-1 (magenta) to highlight microglia; mesh electronics and flexible thin-film probes were imaged by DIC and are pseudocolored blue. (Scale bars in all images, 100 μm.) Credit: Zhou T, Hong G, Fu T-M, Yang X, Schuhmann TG, Robert D. Viveros, RD, Lieber CM (2017) Syringe-injectable mesh electronics integrate seamlessly with minimal chronic immune response in the brain. Proc Natl Acad Sci USA 114(23):5894-5899. The minimal, recoverable acute damage and the absence of an immune response support the possibility that mesh electronics may be permanently viable. "According to our past and ongoing studies thus far, mesh probes can maintain a stable recording/stimulation interface with the brain tissue for at least one to two years," Lieber says. "However, this time period does not represent the achievable life expectancy since ongoing studies are currently under way to demonstrate even longer-term stability." Due to the limitation of the rodent two- to three-year lifetime, the scientists expect to find more extensive stability in longer-living mammals such as rhesus macaques and in studies currently under way. "In the case with absent immune response as demonstrated in our recent paper, the life expectancy of mesh electronics should only be determined by biocompatibility and lifetime of the materials, including the metal electrodes (gold and platinum, which are both inert), and the passivating polymer that has been studied extensively in previous publications (such as Nemani et al 2) to show long-term stability in physiological conditions). Therefore, we remain confident that mesh electronics will likely have a life expectancy with stable neural interface and recording/stimulation functions for years, and envision the mesh ultimately as lifetime implant." However, Lieber adds, should the mesh need to be removed, it can be directly extracted with minimum force and damage to the brain. "While this could cause a small amount of damage due to seamless integration with neural tissue, we believe the unprecedented stability and absence of chronic immune response of our neural tissue-like mesh electronics will lead to a paradigm change where the probe is a lifelong implantation that does not require removal." Moving forward, Lieber says that they are conducting ongoing studies of new mesh designs having high large numbers of electrodes and multisite injections. "Moreover, our next steps include implantations of mesh electronics into tissues and organs other than the brain—for example, in the eye for in vivo recording of single retinal ganglion cells, in the spinal cord, in the muscle for studying signal propagation at the neuromuscular junction, and so on. We're also beginning studies exploiting the unprecedented stability and absence of chronic immune response of the mesh electronics in Alzheimer's and Parkinson's disease models, and are working on implantation of mesh electronics in non-human primates subjects and human patients." They also see a wide range of current and potential applications benefitting from the use of their mesh probe, including spinal cord and neuromuscular junction implants, brain–machine interfaces, cyborg animals, natural and pathological aging (such as Alzheimer's disease) with insight on how spatial memory and learning evolve as a function of age and disease stage. Moreover, by adding stimulation electrodes, being able to enable fine level feedback that can ameliorate or overcome the cognitive declines associated with aging and other neurodegenerative diseases. As to other areas of research that might benefit from their study, Lieber says that in general, most areas of fundamental neuroscience research could benefit from mesh electronics' unique capabilities of long-term stability and single neuron resolution. "In addition, almost any clinical/medical application that involves electrical recordings and/or stimulations will benefit from our studies. In addition to that mentioned above," he concludes, "the mesh electronics should provide unique opportunities for brain-machine interfaces for tetraplegic patients, deep brain stimulations for the treatment of Parkinson's disease, and neural prosthetics in general."